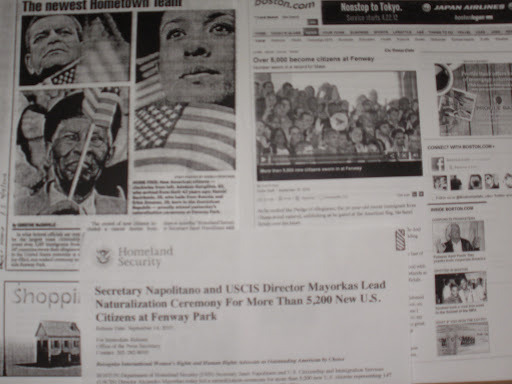 News analysis: five New England Newspapers on the naturalization issue (Sept 14th 2010). One of the recurrent critiques at the Media and Public policy workshop was the superficiality of media coverage. Students who took the workshop were able to identify the roots and sources of that superficiality problem: media bias; use of euphemisms; political bias and lack of context. The workshop looked at the information as an outcome of not only the reporter who writes stories but also an outcome of the time, the media itself and the actors. In order to further news analysis, this essay compares the coverage of single news by five different newspapers in New England. In the first part we summarize the method used for the comparison which was taken from Teun van Dijk’s discourse analysis theory. In section two of this essay we present our findings regarding the mentioned comparison. And finally we present some conclusions. This paper makes a comparison of a single event that took place in Boston Massachusetts. The event was a naturalization ceremony in which more than 5.200 Immigrants became citizens of the United States. The government represented by the secretary of Homeland security granted the new civil status to the immigrants at Red Sox stadium Fenway Park. The coverage of the ceremony was done by information offices, press agencies and local newspapers. The news reports were given by the Office of the Press Secretary at the Department of Homeland Security; The Boston Globe; The Boston Herald; Nashua Telegraph; El Planeta and Associated Press. The first step taken in this analysis was a basic association. The subject we are comparing here may be related to a more broadly issue: racism. Teun van Dijk provides a framework for analyzing news in the context of a racially divided society. One might think that Immigration Issues might be related to racism, however, there is certainly not too much evidence we can use to bolster the association. The following graph may help us support our assumption. Graph #1 takes data provided by van Dijk (1988). Generally speaking what researchers found is that ethnic affairs or race affairs are broadly covered as immigration issues. The top one media coverage when it comes to do with race is Immigration news. Therefore –here is our assumption- immigration coverage can be associated to race coverage. Data taken from van Dijk, (1988). The second step was an attempt to define a method to compare the same news. Because the subject is identical in all of them, differences might be at the details. Van Dijk’s proposal for analyzing news suggests ten aspect of the discourse used to portray racial issues and in this case immigration issues. The first aspect we should compare is the presentation of the news, which means basically the location, the usage of photos, the size and the type of media text. In this regard we do not have chance to analyze neither location nor size, and the type is the same in all of the sources. Therefore the measure we use here for size is length in words. In the second place, the method requires analyzing the subject which is the same in all samples. Thematic structure comes in third place of the analysis. It basically relates the perspective commonly used by mainstream media on immigrants. For Van Dijk this perspective is understood in terms of problems caused by immigrants due to the racial division. We certainly do not expect our sample to show the same outcome as in van Dijk’s research. The forth aspect to compare are the Headlines and its key words. The words that best summarize the headline and at the same time best summarize the news. Fifth, who is speaking is a key aspect in determining the ideological orientation of the news. The category “doubt” refers to an attempt to build a “them-group” made by the media. It basically means a disfranchisement strategy made from the media in order to portray immigrants as non-part of the mainstream culture. Evaluation and description are aspects that require attention for the adjectives that better describe people at news. It gives you necessarily a hint about the political and moral stand of the newspaper. Finally, Explanation is what lies beneath the text. The reason behind the event and behind the editorial decision to publish the content in the newspaper. We take these ten categories of analysis and cross them through the five sources of information. The next section summarizes the findings. Table # 1 summarizes briefly the comparison among the newspapers. We must acknowledge that reaching solid conclusion from that sample size is always risky. From these five articles we do not have enough evidence to draw generalizations. However, there is a couple of insight that can be pointed out. News comparative analysis: Naturalization ceremony at Fenway Park. Three photos picturing Faces and American Flags. Political reasons: “I am ready to vote”. One photo picturing one face and an American flag. The use of pictures in the articles is restricted to three of them. The Boston Globe is the only one that had video. All images have the same theme: Latino faces and the American Flag. These articles reflect a growing association between immigration and Latino Communities, which is easy to demonstrate demographically. In this case the demographic reality is portrayed in the media. On the other hand, the fact that articles at Nashua Telegraph and Homeland Security Press Office may not lead this analysis to have a political interpretation. By not including photo in its articles, this essay cannot conclude anti-immigration editorial policy, at least in the case of Nashua Telegraph. At first glance the ranking would describe editorial inclination and editorial preferences as follow: Boston Globe would have an editorial policy in which immigration policies are more important than it seems to be at El Planeta. However, it is evident that by just counting the words in one article such conclusion cannot be accepted. Naturally, El Planeta would be the most interested media in cover such news. Nonetheless, El Planeta article is a reproduction of Associated Press, which means El Planeta did not have a reporter on site. If one associates these two facts may conclude that it might be a matter of technical and staff resources. Although thematic structure is related to the subject, there is a substantial difference that has to do with the way news actors are portrayed by the media. In our articles it is possible to identify at least three big arguments, all of them political. Immigrants portrayed as solution, as free riders and subjects of political maneuvers. Boston Herald and the Boston Globe somehow show immigrant population as a group that is taking advantage of established benefits of being U.S. citizen. Nashua Telegraph send a message about a political maneuver. So does El Planeta. Homeland Security Press Office shows a group of national builders and contributors. Boston Globe and Boston Herald stress the fact of “new comers”. Their headlines basically reflect their intention of sending a message of “new” social configuration. Homeland Security was very candid in saying it is a naturalization, which involves a natural process. All natural things imply inexorability. Sooner than later this process was going to take place. That is the message from Homeland Security. Nashua Telegraph is less confident and place the event under a promises of oath. El Planeta Headline follow its interest of alluring hispanic readers. A determinant of style and editorial orientation can be found by identifying the political stand of the newspapers. It requires more than one article to identify the real political stand of a news paper. However, opinion among classmates may help shed this issue. Classmates agree in the classification shown in the graph #1. That classification shows coherence with the rest of the aspects analyzed in this essay. The context in which van Dijk places his analysis of immigration is deeply related to discrimination and racism. As long as this essay chose that framework, it is constrained to determine whether or not articles creates an image of others. All articles look at the immigrant population as others by quoting them and editing fragments of their answers. Nonetheless, it is not possible to establish a serious conclusion about racism with this limited sample. Finally, unlike the newspapers, Homeland Security Press Office makes assumption of assimilation. Finally, the comparison shows an interesting balance of information bias. The Boston Globe and The Boston Herald show in their quotes professional well educated immigrants. Both newspapers exhibit immigrants as people able to contribute. By looking at the previous aspects, one might expect ridiculous interviewees. However both newspapers avoid showing immigrants bad facade.